This paper reports on the characterization of paint samples from polychrome sculptures in the main cave of the Zhongshan Grottoes, China. Optical Microscopy (OM), Environmental Scanning Electron Microscopy in combination with Energy Dispersive X-ray analysis (ESEM/EDX), Fourier Transform Infrared spectroscopy (FTIR) and Raman spectroscopy were carried out in order to study the stratigraphy of the sculptural polychromy and to determine the painting materials. Minium Pb3O4 and mercury sulphide HgS, cinnabar or its synthetic form vermilion were found as red pigments. Two mixtures were used to produce a rose color: lead white Pb3 (CO3)2 (OH)2 with minium and hematite added to gypsum. Yellow was attributed to an ochre. The green paint layer has been identified as botallackite [Cu2(OH)3Cl], an isomer of atacamite and paratacamite. Copper oxalate was also found in this green paint layer and calcium oxalate were detected in a numerous of paint layers without restriction to any specific colors. 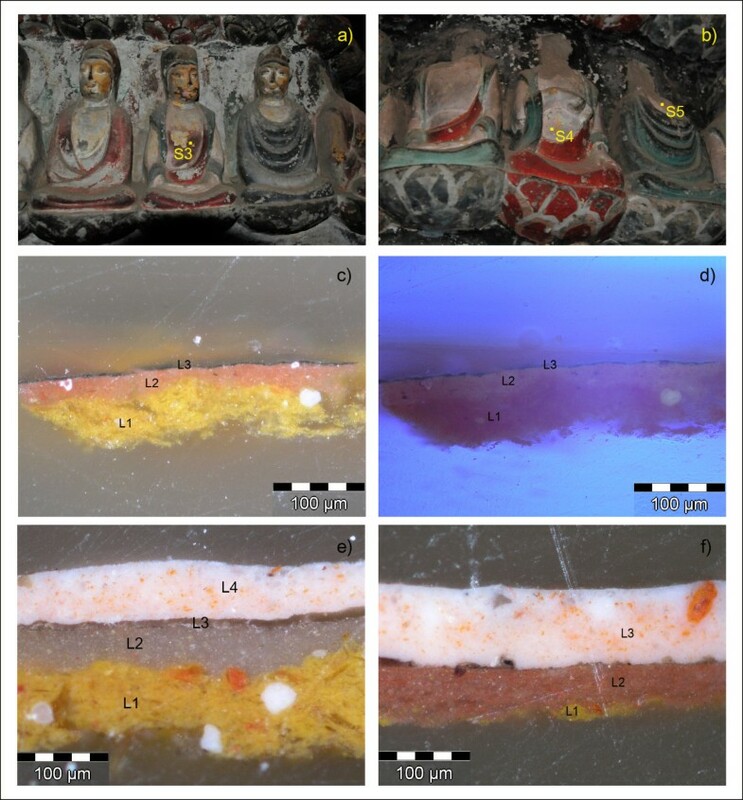 Pigments and their use as mixture or as overlapping different paint layers in Zhongshan Grottoes were identified on a selected number of samples. Over painted areas could be identified and two reasons could explained the blackening of the paintings: a loss of the fragilized colored paint layer, which make the underneath black paint layer visible and a darkening of the upper paint layer, due to the burning of the candles in the temple. Furthermore, FTIR analysis performed on the samples give the indication of an oily binder. The Buddhist site of Zhongshan Grottoes (Figure 1) is situated on the southern foot of Zhongshan mountain, northward of Yan’an, in the valley of the Xiu Yan River (Shaanxi province, China). 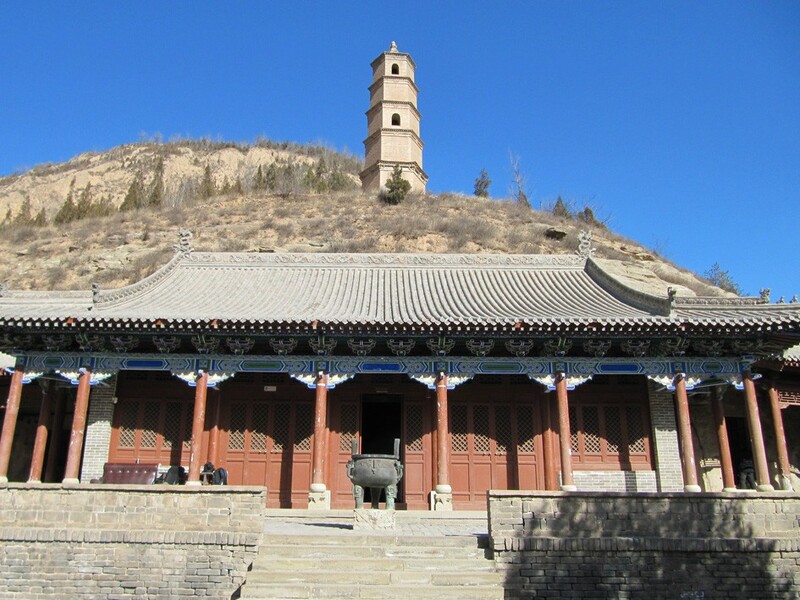 The main grotto was carved into the soft rock of the mountain in 1067 during the fourth year of Zhiping Reign of Northern Song Dynasty. The cave presents an octagonal shape with a width of 16,7 m, three openings and five halls, which roof is supported by eight carved pillars. Sixteen 2–3 m high Buddha figures encircling a central Buddha altar, and more than ten thousands of Buddha sculptures chiseled in the walls and pillars decorate the grotto [1, 2]. Entrance to the main cave of Zhongshan Grottoes , China. Zhongshan Grottoes have an important historical and artistic value and has been listed among the key cultural sites of China since 1988. A partial copy is shown in the Shaanxi Historical Museum in Xi’an. The conservation state of the statues from Zhongshan Grottoes varies from well preserved to severely eroded. The geographic situation of the grottoes with the local environmental conditions has induced severe damages. Wind and water transportation due to capillary rise have been leading to erosion (Figure 2), salt accumulation and to the formation of cracks in the stone. One important focus of research was therefore so far the investigation of consolidation options for the weathered sandstone [2, 3]. More recently, pigments and binding media of six samples (blue, red and green), taken from the lotus-leaves basement up-holding one of the Buddha statues were analyzed . The identification of the materials used represents a work of major importance as the painting technique, over painted areas as well as degradation of the paintings (e.g. blackening) can hence be elucidated. The present paper will show the analytical results of 8 samples (green, rose tones, yellow, red/orange and black) taken in the main cave of Zhongshan Grottoes and will stress out the differences and new aspects obtained in relation to the article of Cauzzi et al.. Damages on the lowest Buddha figures caused by erosion. The investigation concentrates on the identification of pigments, using complementary analytical techniques for a full characterization of the constituents. Optical Microscopy (OM), Environmental Scanning Electron Microscopy in combination with Energy Dispersive X-ray analysis (ESEM/EDX), Fourier Transform Infrared spectroscopy (FTIR) and Raman spectroscopy were carried out in order to study the stratigraphy of the sculptural polychromy. 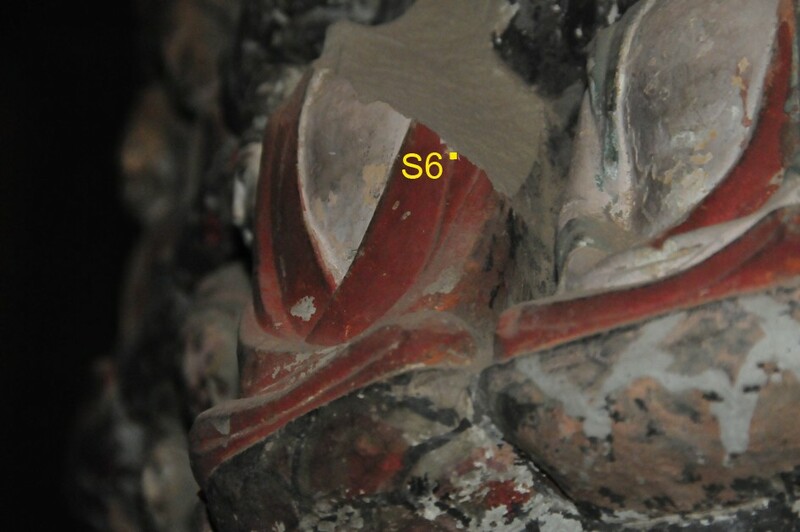 Paint samples were taken in the main cave, on several Buddha statues from the right pillar behind the central Buddha altar (Figure 3), aspiring to extract them with their complete stratigraphies. Exact sampling locations are shown in the corresponding paragraphs. Samples were taken from locations presenting different colors or colors superposition. Green was found in 2 samples, the colors red and orange were present together in 2 samples, two different rose tones were found in 4 samples, yellow was observed in 3 samples and one sample present several gold layers. Table 1 summarizes the results of the analytical measurements. Central Buddha altar. Samples were taken from several Buddha statues from the right pillar behind the altar. Two samples, S1 and S2 show a green paint layer (respectively L2 and L3, Table 1) and Figure 4 reports the sampling locations as well as the VIS photomicrograph of the cross-sections. ESEM/EDX analysis indicated the presence of a copper chloride in the two bluish green paint layers and FTIR measurements could identify the pigments botallackite and probably atacamite in both cases (Figure 5). Photographic documentation of samples S1 and S2. a) and b) Sampling location and VIS-photomicrograph of sample S1, c) and d) Sampling location and VIS-photomicrograph of sample S2. 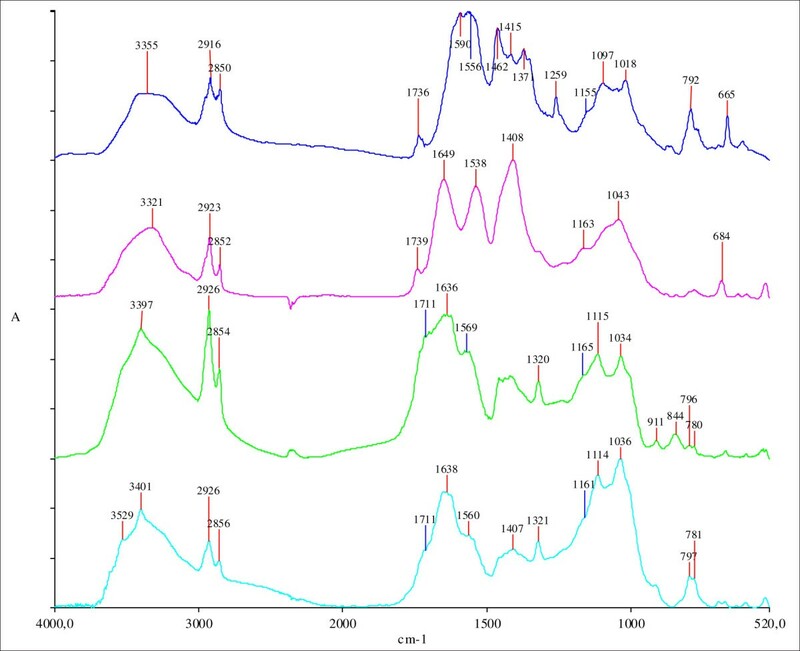 From the top to the bottom: FTIR spectra of the references botallackite and atacamite with FTIR spectra of the green paint layers from samples S2 (L3) and S1 (L2). These two compounds are together with paratacamite and clinoatacamite isomers and have the same chemical composition Cu2(OH)3Cl . Nevertheless, due to their different crystal system, it is possible to distinguish them by their different absorption pattern in the region 3400–3200 cm-1 (hydroxyl stretching vibrations) and the fingerprint region 1100–700 cm-1 by means of FTIR [5, 6]. Atacamite is not confirmed as only one band at 3353 cm-1 suggests its presence and Raman spectroscopy did not revealed the corresponding evidence. 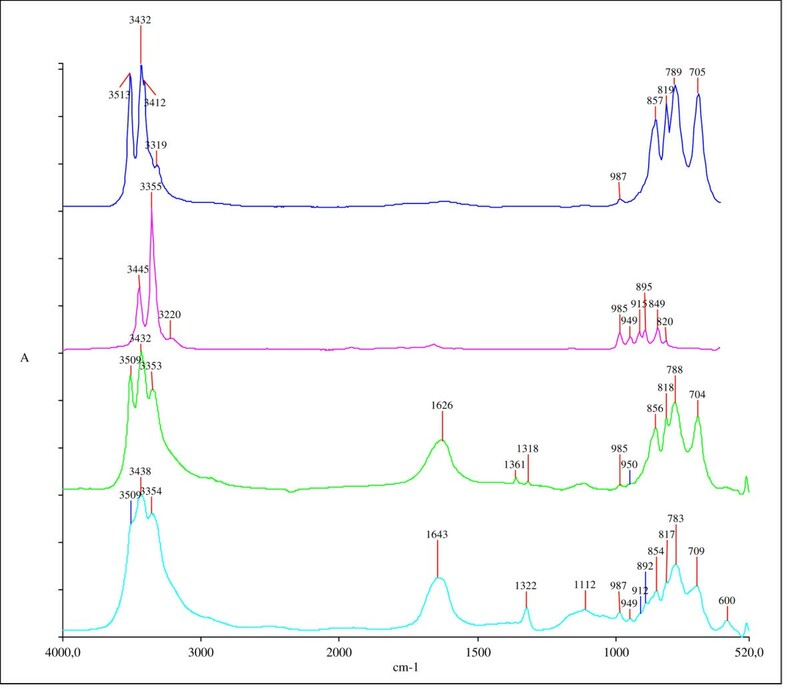 Moreover, the FTIR spectra of the green paint layer of samples S1 and S2 show vibrational bands at 1650–1620 cm-1, 1360/1320 cm-1 and 1320 cm-1, which correspond to the carbonyl stretching vibrations of copper and respectively calcium oxalate . While the use of atacamite is well known in Chinese sculptural polychromies, wall paintings and other works of art [8–11], botallackite was rarely found as a painting pigment. However, it was identified in wall paintings from the Bingling Temple near Lanzhou, Ganzu Province  as well as in a painted sculpture from Yulin Grottoes . In the context of degradation and corrosion of bronze objects, the presence of botallackite was also reported . The rare cases in which botallackite has been characterized could be explained by its lower stability in comparison to the other copper trihydroxychlorides and its rare naturally occurrence [4, 15]. The spherical form of the crystals, as seen in Figure 4b, suggests a synthetic origin of the pigment, rather than a source in the natural mineral . The three green paint samples, analysed by Cauzzi et al. were identified as a mixture of atacamite and malachite. The samples were taken from the lotus-leaves basement up-holding one of the Buddhas . 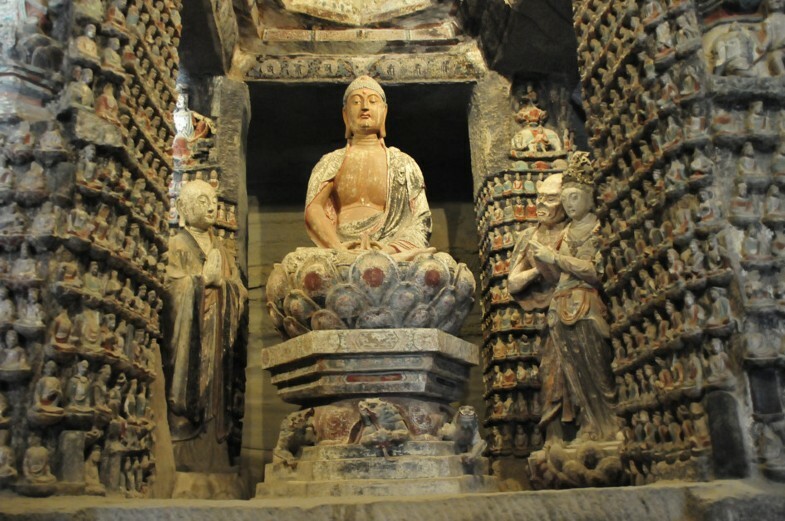 It can therefore be assumed that the green areas of the main cave of Zhongshan Grottoes were painted with different green materials: either a mixture of atacamite with malachite (lotus leaves) or with the pigment botallackite (robe of the Buddha statues). In order to produce a rich palette of colors and tonalities, painters have the possibility to use a large number of materials (inorganic and organic colorants) as a mixture or as an overlay of several paint layers. These different techniques can clearly be recognized in samples S3, S4 and S5 (Figure 6). Two ways of fabrication mixing different pigments were used to obtain two tones of rose. Photographic documentation of samples S3, S4 and S5. a) and b) Sampling locations, c) and d) VIS- and UV-photomicrographs of sample S3, e) and f) VIS-photomicrographs of samples S4 and S5 respectively. Samples S1, S4 and S5 (L1, L4 and L3 respectively, Table 1) show a mixture of a white and orange pigments, which, depending on the proportion of the orange pigment can result in a slight rose paint layer (Figures 4b, 6e and 6f). 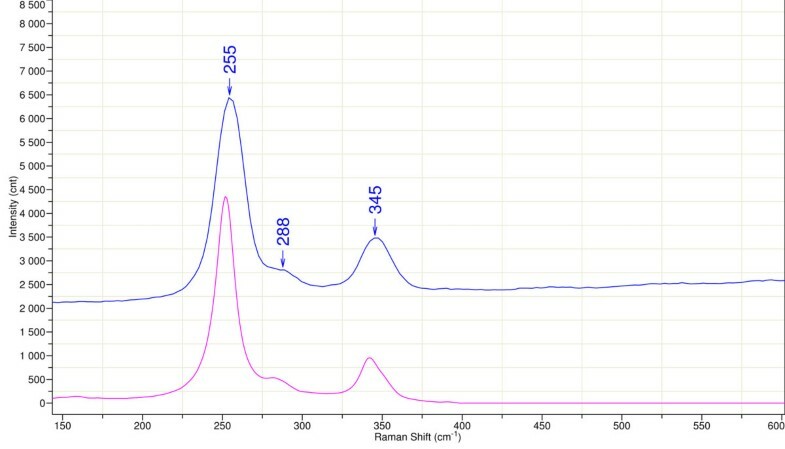 This rose tone consists of a mixture of lead white Pb3 (CO3)2 (OH)2 with minium Pb3O4, determined by means of FTIR and Raman spectroscopy respectively. Another deeper rose tone was observed in samples S3 and S5 (both cases L2, Table 1). The UV-photomicrograph (Figure 6d) reveals a white pigment in the rose paint layer and Raman spectroscopy could characterize a mixture of hematite and gypsum (Figure 7). 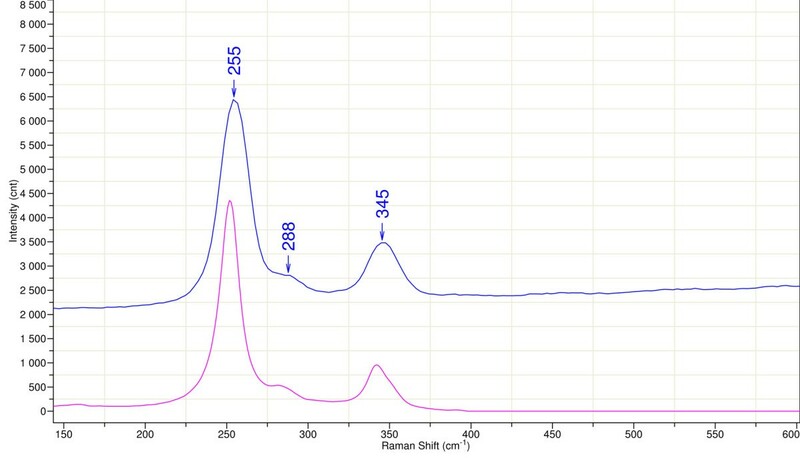 Raman spectra of the rose paint layer L2 from sample S3 (785 nm laser). From the top to the bottom: white area from the rose paint layer, red area from the rose paint layer and reference spectra of gypsum and hematite. Furthermore, all samples taken from rose areas show a yellow paint layer (yellow ochre) in their stratigraphies. FTIR analysis identified mainly the silicate kaolinite Al4[Si4O10](OH)8 and calcium oxalate (Figure 8). Beside the element aluminum (Al) and silicon (Si), ESEM/EDX measurement shows the presence of iron (Fe), which oxihydroxides are responsible for the yellow color of the earth pigment (Figure 9). 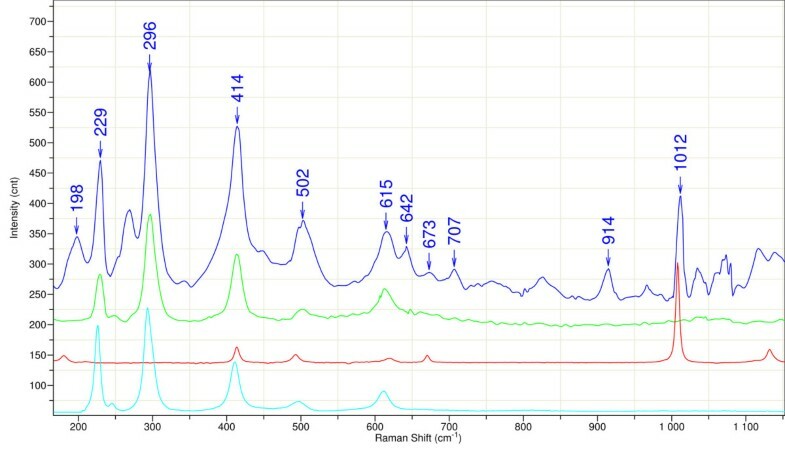 From the top to the bottom: FTIR spectrum of the yellow paint layer L1 from sample S4 with reference spectra of kaolinite and calcium oxalate. ESEM/EDX of sample S4. a) Backscattered electron image and b) mapping of the elements silicon (Si), lead (Pb) and iron (Fe). The similar stratigraphical structure of samples S3 and S5 (L1 and L2, Figure 6c and 6f) and the thin dirt layer observed in the cross-section of sample S5 between L2 and L3, let suggest that L3 in sample S5, which is made of lead white and minium, is an over paint. The area, in where sample S5 was taken, was insofar originally made of the rose tone composed by gypsum and hematite, lying on a yellow ochre layer, which gives to the rose a warmer tone (L1, Figure 6c). Likewise, sample S4 was probably first yellow consisting in a yellow ochre overlayed with a translucent paint layer (L1 and L2 of sample S4, Figure 6e), made of a silicate (Table 1). The thin transparent layer, named as L3 in the cross-section of sample S4 is possibly due to a mechanical separation of the layers L2 and L4. In fact, no other absorption bands as those from the embedding resin were registered by means of ATR-FTIR imaging. This separation between the layers is also evidenced by the backscatterd electron image in Figure 9. Sample S6, taken from the robe of one Buddha (Figure 10) is a good example to illustrate the technique of overlapping several colors in order to produce specific color tones. By the way of applying a red paint layer over an orange one, as seen in the stratigraphy of sample S6 (Figure 11, L4 and L5), a deep red color was obtained. Furthermore, the presence of two ground layers (L1 and L3) could be an indication of an over painted area. Sampling location of sample S6. Sample S6, a) VIS-photomicrograph and b) UV-photomicrograph. The orange paint layer L2 was identified as red lead, ie minium Pb3O4 by means of Raman spectroscopy. Besides minium, the yellow pigments litharge and massicot were also found in the orange paint layer L4 (Figure 12). Both of them are a lead (II) oxide with composition PbO and have different crystal system, tetragonal and orthorhombic respectively. The use of litharge in Chinese and Central Asian paintings along the ancient Silk Road is rarely reported in literature and the pigment is even described as an exotic painting material . The presence of litharge and massicot could eventually be explained by an imperfect synthesis of red lead, where the both lead (II) oxides are formed as impurities . From the top to the bottom: Raman spectrum of the orange paint layer L4 from sample S6 (638 nm laser) with reference spectra of litharge and massicot. Mercury sulfide (HgS) constitutes the red paint layer on the top of the stratigraphy (L5). Raman measurement with the typical peaks at 255, 288 and 345 cm-1 (Figure 13), does not allow to distinguish between the natural mineral cinnabar and the synthetic vermilion. According to the geographical situation of Zhongshan Grottoes in relation to natural deposit of cinnabar (China, Japan) and according to the fact that the synthesis of mercury sulfide during the Northern Song Dynasty was still known, the presence of both cinnabar and vermilion is possible [1, 9, 17]. From the top to the bottom: Raman spectrum of the red paint layer L5 from sample S6 (785 nm laser) with reference spectrum of cinnabar. Two reasons can explain the darkening of the polychromic surface. On the sampling location of a sample S2, a loss of the powdery upper green layer (L3) could be observed, which let appear the black paint layer L2 underneath (Figure 4c). On the other side, the cross-section of sample S3, shown in Figure 6c, presents as upper layer an extremely thin (approximately 3 μm) black layer (L3). 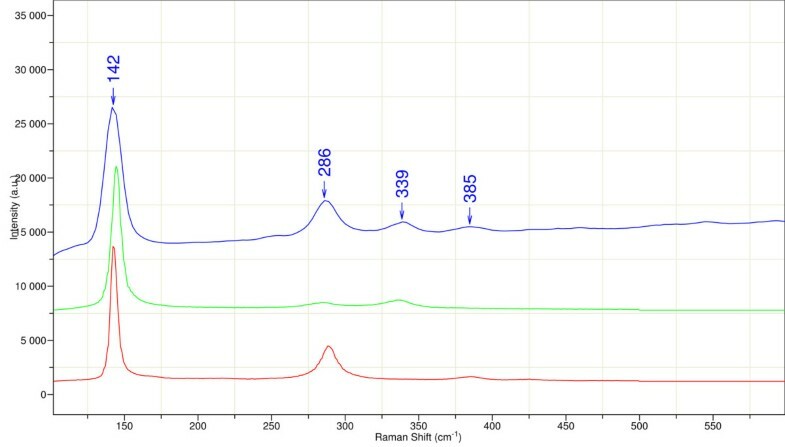 Raman spectroscopy could detect carbon black, which origin can be attributed to the fumes generated by the use of candles and incense in the temple (Figure 6a). Oxalates and particularly calcium oxalate were detected in a numerous of paint layers without restriction to any specific colors (ground layer, yellow, green, rose red). Copper oxalate was also found in one green sample consisting of botallackite. Calcium and copper oxalates can easily be distinguished through FTIR spectroscopy with their typical vibrational bands between 1320 and 1360 cm-1. Calcium oxalate presents only one carbonyl stretching vibration at 1320 cm-1, while copper oxalate shows two absorption bands at 1320 and 1360 cm-1. The identification of metal oxalates has been often reported in literature over the past decades [18–21]. Their formation could be the result of the attack of sensitive pigments, such as calcium carbonate by oxalic acid. Several sources for the presence of oxalic acid are conceivable: it is a metabolism product of lichens and fungi, it can be produced by many plants  and the photo-oxidation of organic binding media can conduct to the formation of low molecular-weight dicarboxylic acids, which can again convert in the lowest unit of oxalate acid . 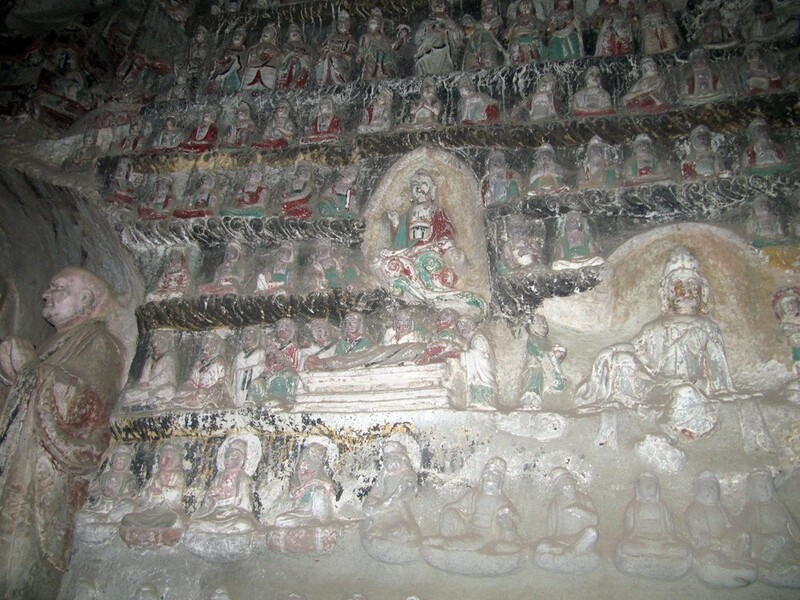 The origin of oxalates in the paint layers from Zhongshan Grottoes is unclear. Nevertheless, they are probably products formed during alteration and degradation processes caused by oxalic acid. The analysis of binding media was not the issue of this work. 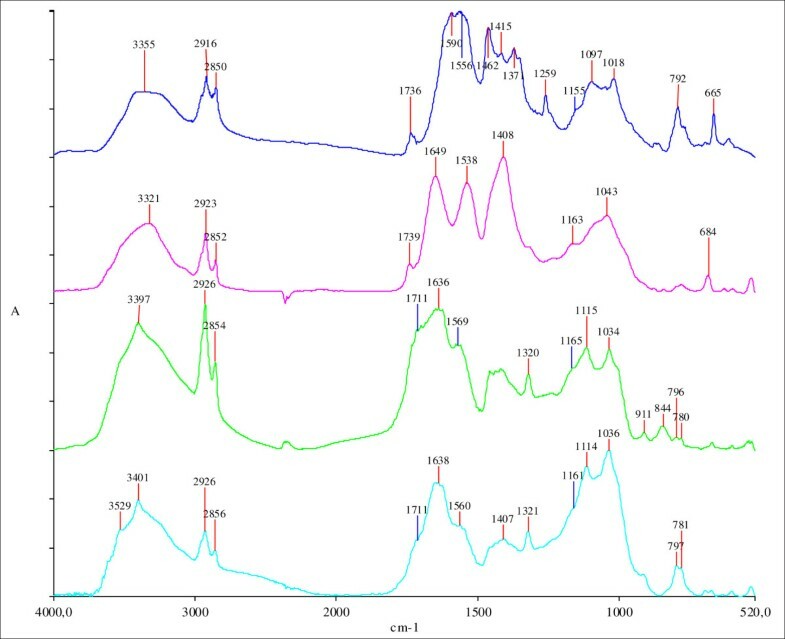 Nevertheless, FTIR analysis of some paint layers give some indication for oil as a binder, which is in accordance with the results presenting by Cauzzi et al..
FTIR spectra of samples S3 (trichlormethane extract), S6, S7 and S8 are presented in Figure 14 . Different features let presume the presence of an oil as binding medium: the C-H stretching vibrations at 2920/285 cm-1, the carbonyl stretching band located at 1738 cm-1 or the large absorption band in the region of the carbonyl stretching in case of samples S7 and S8, which could correspond to the presence of several species (ester, free fatty acid). Moreover, the absorption bands between 1650–1540 cm-1 could be attributed to carboxylates, which formed during the degradation reaction of an oily binder with metal cations from the paint layers. FTIR spectra of different samples. From the top to the bottom: chloroform extraction from sample S3 (L2 + L3), sample S6 (L4 + L5), sample S7 (L4) and sample S8 (gold + preparation layer). After microscopic observations and documentation of the sample particles using a digital microscope Keyence VHX-500FD, cross-sections were prepared by embedding the samples in epoxy resin (EpoFix® Resin and Hardener supplied by Struers) and further by polishing them with Micromesh® abrasive cloths of decreasing granulometry (from 1500 to 12000 mesh size). Optical microscopy on the cross-sections revealed the different layers of the stratigraphy. For this purpose, visible (VIS) and ultraviolet photomicrographs (UV, 365 nm excitation wavelength) were taken using an Olympus BX 50 microscope or an Axio Imager A2m microscope (Zeiss). The elemental distribution through the cross-sections were determined by ESEM/EDX analysis, performed at 20 kV by Quanta 200 ESEM (FEI) equipped with a backscattered electron detector and energy dispersive X-ray analyzer XFlash 4010 (Bruker). The identification of pigments was carried out by means of FTIR and Raman spectroscopy. FTIR analysis of pigment particles were performed with a Paragon 1000 spectrometer from Perkin Elmer equipped with a microscope. FTIR spectra were recorded in transmission mode in the 4000 – 500 cm-1 range, with a resolution of 4 cm-1. FTIR spectra were compared with spectra from the IRUG (Infrared and Raman Users Group) database and from the own database of the Rathgen Research Laboratory. The extraction in trichlormethan was made as follow: a little volume (<1 mL) of solvent was added to the paint layer and slightly warmed up at ca. 40°C. The solvent was then evaporated on a cavity microscope glass slide and the residue was measured by FTIR. Raman spectroscopy was performed on particles or cross-sections. Raman spectra were obtained using a HORIBA XploRA Raman-microscope, equipped with three excitation light sources: 532 nm, 638 nm and a 785 nm laser and compared with HORIBA’s spectral databases. The painting technique of the polychrome sculptures from Zhongshan Grottoes, in northern Shaanxi province is unwell studied so far. Only one publication could be found in relation to this Chinese cultural site . Eight samples, taken from the main cave were investigated using several complementary techniques, including microscopy, FTIR and Raman spectroscopy and ESEM/EDX, in order to understand the stratigraphy and to characterized the materials used. Usual pigments as earth pigments (yellow and red ochre), lead pigments (lead white and minium), cinnabar, gypsum and kaolinite were found. However, the green pigment was identified as botallackite, a more rarely indentified material, which is an isomer of the better known atacamite and paratacamite. 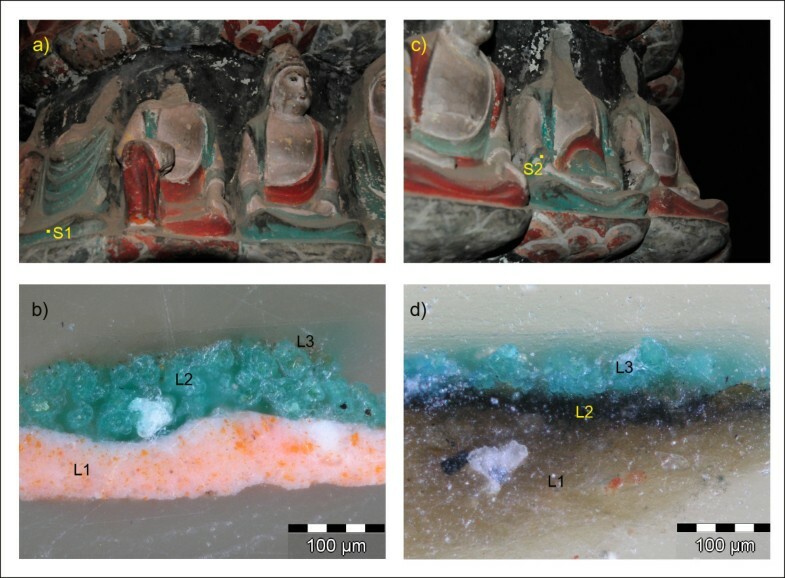 The discordance in the results obtained between the three green samples examined by Cauzzi et al., all of them characterized as a mixture of malachite and atacamite and the two green samples analyzed here (both identified as botallackite) can be explained by different sampling locations: the lotus-leaves basement up-holding one of the Buddha statues  and the right pillar behind the central Buddha altar respectively. Nevertheless, further examinations should be carried out in order to understand if one pigment would correspond to a latter application. Over painted areas could namely be detected comparing the stratigraphy of three samples, taken in different rose tone regions. A mixture of hematite and gypsum, as well as a yellow ochre overlayed by a translucent paint layer (silicate) were both over painted with a mixture of lead white and minium, resulting in a slight rose color. Prof He Ling from Xi’an Jiaotong University and Prof. Jiang Baolian for the collaboration during the sampling in situ. SS performed the sampling in situ. EE carried out the analysis. EE drafted the manuscript and SS revised it critically. Both authors read and approved the final manuscript.